MSI delivers its GeForce GTX 680 Twin Frozr III. 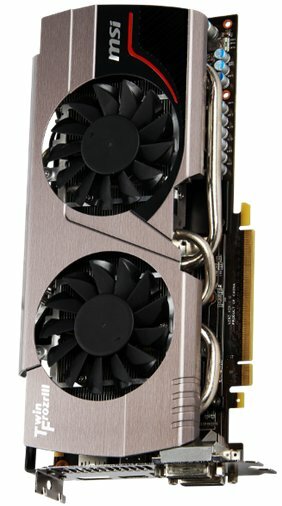 This card features a custom cooler, it has a 1058MHz base clock, 1124MHz boost, and 2GB GDDR5 clocked at 6008MHz. Display outputs include DL-DVI-I / DL-DVI-D / DisplayPort / HDMI. 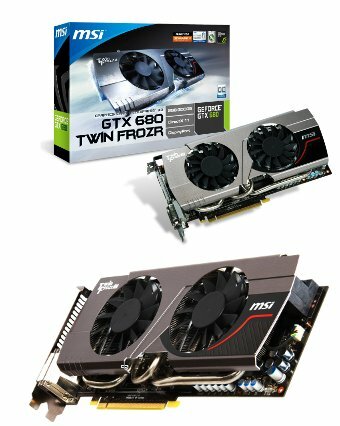 MSI, world's leading graphics card and mainboard brand is pleased to announce the availability of the N680GTX Twin Frozr 2GD5/OC. The N680GTX Twin Frozr 2GD5/OC is MSI's first custom graphics card in the new NVIDIA GeForce 600 series engineered for optimal thermal specifications and performance. Thanks to MSI's Twin Frozr III cooler the N680GTX Twin Frozr 2GD5/OC in its overclocked state stays 22°C cooler than the reference design. Because a graphics cards' primary purpose is to output great graphics and not noise, the Twin Frozr III cooler on the N680GTX Twin Frozr 2GD5/OC stays over 10 dB quieter compared to the reference design. The MSI N680GTX Twin Frozr 2GD5/OC is equipped with the cooler that cooled the world's fastest GTX 580, MSI's N580GTX Lightning with Twin Frozr III. Because of the excellent thermal characteristics the Twin Frozr III cooler is able to keep the N680GTX Twin Frozr 2GD5/OC 22°C cooler when compared to the reference design. A cooler graphics card has numerous benefits such as reduced power consumption and higher overclocking potential. A graphics cards main purpose is to display amazing visuals and fidelity and any side effects should be seen as detrimental. That is why the Twin Frozr III not only allows for excellent cooling performance, but it also does this at a ridiculously low noise level of just 28 dB under full load. This is over 10 dB quieter than the reference design cooler and nearly inaudible in even a modern enthusiast PC. The MSI N680GTX Twin Frozr 2GD5/OC supports NVIDIA's GPU Boost technology that allows the core clock to be adjusted on the fly for optimal performance. When used with MSI's exclusive Afterburner overclocking utility, gamers can control the power limit and clock offset for better overclocking capability. The card is also equipped with advanced fanspeed control based on GPU temperature. Afterburner comes with MSI Predator Audio/Video capturing function and you can even use smart phones to control the graphics card. When combined with the Kombustor burn-in testing function, it is an indispensable tool for enthusiasts looking to get the most out of their graphics card. Apart from supporting the latest DirectX 11 technology, the MSI N680GTX Twin Frozr 2GD5/OC graphics cards has the ability to run NVIDIA 3DVision Surround using three 3D monitors and 3D glasses with just a single card. Gamers will be able to enjoy the spectacular visuals of 3D games and movies. Additionally, support for up to four displays driven by one graphics card allows gamers to make the most of multiple-monitor configurations.